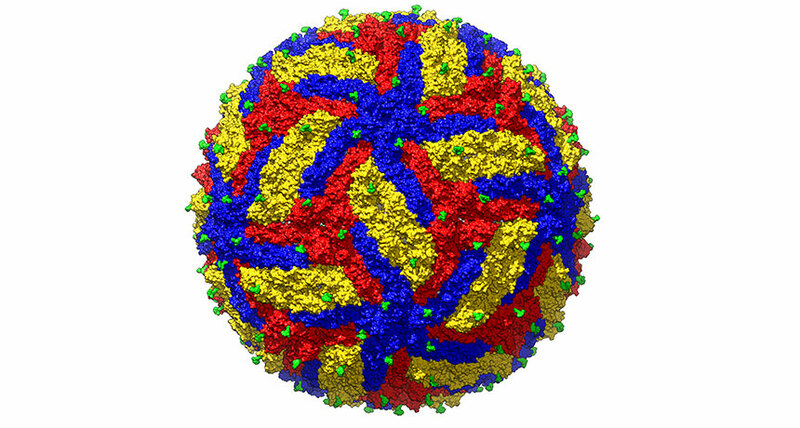 GZIKA REVEALED A high-resolution model of the Zika virus shows that its envelope protein, which helps the virus get into cells, makes three distinct shapes (yellow, red and blue) that fit together. Sugar molecules known as glycans (green) stud the protein molecules. Researchers have gotten the closest look ever at Zika virus and may have discovered some chinks in its armor. Using cryo-electron microscopy, structural biologist Madhumati Sevvana and colleagues mapped Zika’s structure at 3.1-angstrom (or 0.31-nanometer) resolution. That closeup view, reported online June 26 in Structure, is about equivalent to the size two atoms. It’s the most zoomed-in image that scientists have gotten of any flavivirus, the family of viruses that includes Zika, dengue, yellow fever, West Nile and Japanese encephalitis viruses, among others. Comparing Zika’s structure with that of some of the other flaviviruses revealed a few differences that might account for different symptoms produced by the various viruses, says Sevvana of Purdue University in West Lafayette, Ind. But more work is needed to know for sure, she says. The researchers did identify some pockets where drugs may be able to dock and disrupt the Zika virus, Sevvana says.